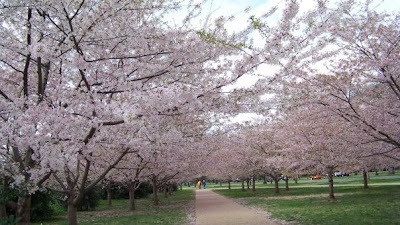 What's happening in April 2011: cherry blossom festivals and a sunset booze cruise! Cherry blossoms are on their way! Photo courtesy of Heather Smith. April is the month to enjoy perfect spring weather and view the cherry blossoms! Here is a comprehensive list of whats going on this month around Korea. Be sure to check back for updates throughout the month! April 1-10 Jinhae Cherry Blossom Festival: This festival takes place in the Gyeongsangnam-do region. See the thousands off cherry blossoms on the tree lined streets. Over 2 million tourists come each year to see the blossoms. Check out more at the Korea Tourism Org. April 8 TOMODACHI Music Fundraiser: Help Japan by attending the TOMODACHI Music Fundraiser in Itaewon this Friday. To learn more visit my article about the event here. April 9 Fortress Wall of Bugaksan Hike: This hike is among my favorites, I wrote about it here back in February! If you're not brave enough to follow my directions, you can go with the RASKB. Learn more here. April 8-10 Nonsan Strawberry Festival: Korea's strawberries are among the freshest and sweetest in the world. Visit the area that harvests the most strawberries in Korea . The train ride is 1 hour 30 minutes from Seoul, and you will return with tons of cheap strawberries. To learn more visit the Korea Tourism Org. April 15-17 Cheongpungho Cherry Blossoms Festival: Enjoy the cherry blossoms from the beautiful scenery of Cheongpungho lake. Among the blossoms there are exhibitions, water sports, and even bungee jumping. Click here for more info. April 30 Sunset Booze Cruise: Adventure Korea is hosting another booze cruise on the Han River. There are only 31 seats left as of today April 1st. So book one soon on their website! Visit the Adventure Korea website to purchase tickets online.